Hi Guys, most of the Android phone users face the problem when Google Play Store is not working properly. They will get an error message during downloading any app from Google Play Store. 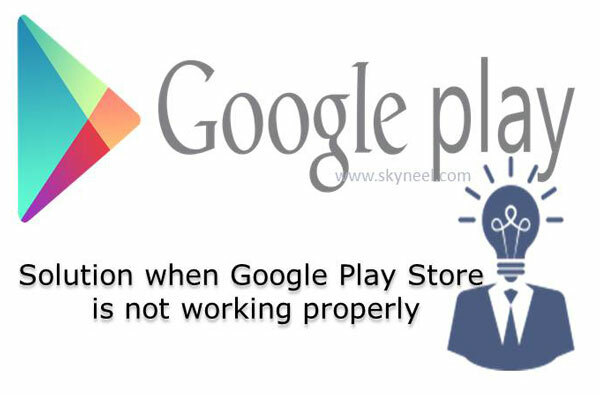 If you already familiar of these problem and want to get the solution when Google Play Store is not working properly, then this article will helps you. Most of the person want to install different kinds of gadgets, apps, games and many more from the Google Play Store. But sometime you will get an error message during downloading the apps, games, gadgets and other things from Google Play Store. You don’t have any idea how to get the solution to overcome that type of problem. This article will help you to provide better solution when Google Play Store is not working properly. Most of the time, if you not able to properly download any app or games from Google Play Store. In that situation you must take few important steps to get the solution when Google Play Store is not working properly. If Google Play Store generate an error message during download and install any app, then you must download and install latest version of Google Play Services. This is another way to get the solution when Google Play Store is not working properly. Most of the Android users love to install lot of apps and games in his smartphone. But they face problem when they stop the downloading and installation process in the mid or sometime they will remove existing app or game from his smartphone. During that time few files are not properly removed and it will generate an error in your Google Play Store. If you want to get the solution when Google Play Store is not working properly. In that situation you must clear the store data from Google Play Store by tap on the “Settings” option. Tap on the “Apps” option > Select the “Google Play Store” and finally tap on the “Clear Data” option. Sometime you must have to clear the Google Play Store cache to get the solution when Google Play Store is not working properly. The cache memory is used to store the data temporarily, which helps to quick retrieved without reloading. But sometime when Google Play Store generate any error during downloading any app then you must clear the cache. If you want to clear the cache then tap on the “Settings” > Tap on the All > Tap on the “Google Play Store” and tap on the “Clear Cache” option. Sometime an updates of Google Play Store will be harmful, due to which it generate an error message. If you want to remove or uninstall Google Play Store updates then tap on the “Settings” > Tap on the “Apps” > Choose Google Play Store. Now tap on the “Uninstall Updates” option. Most of the time when you do all things but not get proper solution, then you have last choice to do a factory reset of your smartphone. But before doing this you must take complete backup of your smartphone data. If you want to take backup of your smartphone then tap on the “Settings”> tap on the Backup & reset> turn on “Backup my data” and also turn on “Backup account” in which you want to take backup. After taking the complete backup of your smartphone then tap on the “Settings”> Backup & reset> Now, tap on the “Factory data reset” option. This option erase all data from your smartphone. I hope this guide will helpful for all those users who want to get the solution when Google Play Store is not working properly. Kindly share this article with others who also face Google Play Store problem. Write your important suggestions regarding this article in the comment box. Thanks to all.